We're eagerly awaiting Gamescom 2014 here at T3.com and, after peeking into our crystal ball, have deduced what to expect at this year's show. Read on, and be informed. Sony is one of the few big publishers holding a keynote at Gamescom, and according to the rumour mill, its presentation is set to bigger than it was at E3. If past form is anything to go by, we can expect a focus on both PS Vita and Indie titles. However, it wouldn't be remiss of Sony to showcase some footage of Triple A titles for the PS4. Top on the wishlist is The Last Guardian – Team Ico's story of a boy and his gryphon, which at this stage feels more like vapourware than an actual game – but we're not holding out too much hope for that. Similarly, we'd love to see some gameplay from the upcoming Uncharted 4, but we're not holding our breath on that one, either. More realistically, we'll see more of DriveClub, perhaps some new levels from the steampunk shooter, The Order: 1886, and Project Morpheus on the convention floor. Microsoft didn't hold a public keynote at last year's Gamescom, and from the looks of things, it doesn't look it's changing this policy for 2014. This may be due to the fact that the Xbox One manufacturer doesn't have anything to add to its impressive showing at E3, where it unveiled a raft of titles in the pipeline for the end of this year and 2015. It would be nice to see more of the likes of Halo: The Master Chief Collection, Platinum Games's DMC/Monster Hunter hybrid Scalebound, or the new reboot of Crackdown. Instead, we expect a few more announcements about exclusive content on some of the biggest IPs in the industry landing first on Xbox One. We also expect to see Forza: Horizon 2 and Sunset Overdrive on the convention floor. Perhaps the single biggest reveal at Gamescom for Xbox One will be the Remedy's new TV show/video game crossover, Quantum Break, which studio head writer Sam Lake promised would make an appearance in Cologne after skipping E3. We have to say that we're intrigued by the prospect as it looks like it's either going to be a revolutionary new way of making games or a train wreck of epic proportions. Either way, it'll be a sight to behold. Like Microsoft, Nintendo isn't holding a keynote but that doesn't mean that it won't have a presence on the convention floor in the form of hands on demos of Super Smash Brothers Wii U, Splatoon and Yoshi's Wooly World – all of which were at E3. Giving us a hands on with the new Starfox game wouldn't be a bad idea, either. With Battlefield: Hardline being pushed back until next year, it looks as though Call Of Duty: Advanced Warfare has this year's late release window all to itself. Sure, there'll be other games available at this time, but in terms of competitive multiplayer, there are few IPs that can take on COD and win. To that end, we expect Activision to place Advanced Warfare's multiplayer mode front and centre, since that's the mode in all COD games that ensures longevity beyond release. COD, however, is only one tip of a gargantuan trifecta we're expecting from Activision. Alongside the publisher's highly lucrative military shooter series, we expect to see the latest instalment of its Skylanders franchise, Skylanders: Trap Team. The new mechanic here allows players to trap enemy characters they find in the game and use them as minions. These trapped characters are stored in the base of the toy peripheral that traps them and they can be used across consoles. 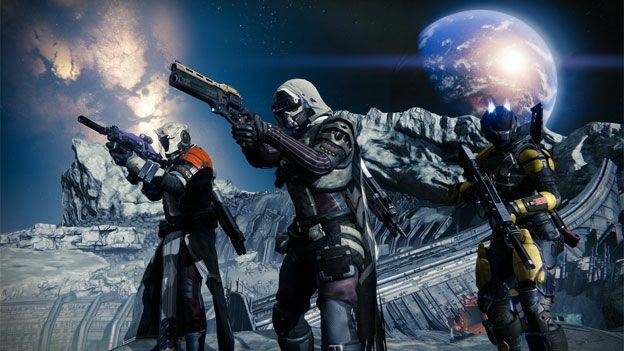 The centrepiece for Activision, this year, is unarguably, Destiny. Even the beta for Bungie's ambitious new sci fi shooter was rather large, by all accounts it barely scratches the surface of what players can expect. EA presents an intriguing prospect at Gamescom. We're certainly expecting news on the publisher's biggest IPs, including FIFA, The Sims, Dragon Age: Inquisition and possibly some footage of the now-delayed Battlefield: Hardline. However, there are quite a few titles that the publisher has already teased at E3, which hopefully, it has more to share about in Cologne. BioWare revealed a couple of details about Mass Effect 4 at the recent San Diego Comic-con – the Mako all terrain vehicle will be returning – so a few more details about that upcoming space opera wouldn't go amiss. The developer has also released a trailer tagged simply “Nightmare”, (http://www.youtube.com/watch?v=32bLpcBoxT8) which is apparently a new IP it plans to reveal at Gamescom. The Crew, Tom Clancy's: The Division, Just Dance and Assassin's Creed: Unity are all pretty much guaranteed to make an appearance in Cologne, since Ubisoft shot most of its bolts at E3. However, the rumour mill is buzzing about an unannounced Assassin's Creed game – AC: Comet – that's apparently going to be a last-gen exclusive. According to the buzz, it takes place just after Assassin's Creed: Black Flag and features Edward Kenway's son, Haytham. If the title actually exists, Gamescom would be the perfect place to announce it. Will Bethesda unveil Fallout 4? Will Batman: Arkham Knight be playable? Will we finally get a hands on with Metal Gear Solid: The Phantom Pain? Will 2K bring Evolve to Cologne? Will Valve unveil Half Life 3? We're betting, no, no, no, yes and hahahahahaha, you must be kidding! Watch the Destiny 2 Gameplay Premiere global livestream event here live!